Money, more specifically budgeting, is one of those topics that everyone urges you to sort out before you get married. Make sure you are both on the same page! It can put a big stress on the marriage if you are not! It is also one of those topics (see also: child rearing) that I thought I totally had figured out. Or at least I did before I got married. If you asked me, I would say I am financially conservative. I like having a savings, I think it is important to plan for a rainy day, I do not gamble, and I do not think that spending an exorbitant amount of money on frivolous things is a good idea. My husband feels exactly the same way. After five years of marriage to an actually fiscally conservative man, I have to admit that I am much less conservative than I thought, and much less conservative than my husband. I love buying things. I buy things when I am happy. I buy things when I am stressed. I buy things when I am sad. I just really enjoy buying things. That is not inherently wrong- it is fine to take pride in ourselves, our appearance, our home, etc. But it should never come at the expense of putting things above the true goals of our life and marriage- to imitate Christ and gain everlasting life with Him in heaven. So obviously, something in my attitude had to change. I had to reevaluate my approach to money, and budgeting, and how I viewed wealth in general. Wealth is not bad. The gospels speak often of feasting, of wine in abundance, and of expensive oils being literally poured out for the betterment and the enjoyment of Christ and his friends. God made everything, and enjoying the good things of His creation is not a bad thing. It is a good, worthy thing to enjoy the goodness of creation. Christ did it. We should not hesitate to do it either. The problem comes in when we elevate these mere things to the level of attachment. To remain complete disciples of Christ while not eschewing the world and its goods (which those of us who are married are certainly not called to do), we must practice detachment, or an attitude of financial stewardship. All that we have is God’s. Our homes, our things, our health, our husbands, even our children. They are all God’s. We have been given the opportunity to enjoy and take care of them for Him while we are here on earth. That is wonderful! We should take pride in the beautiful things that God has given us, and care for them. But we must be frugal. I recently attended a talk with Milwaukee area accountant Maria Johnston, a faithful Catholic wife and mother who knows her way around a spreadsheet. She urged frugality in all things, but to be careful to understand that frugality means different things for people in different situations. Having a lovely home can be good- you can welcome people and bring people together in a way that a slovenly home that is uncared for does not. This does not mean you need a seven-bedroom mansion. Taking care of your things- your car, your clothing, your electronics, with great consideration is frugal. This does not mean that you need to have the newest or most expensive versions of everything- sometimes the opposite, in fact. Even carefully considering a date night with your husband can be a good use of your income since taking time together can strengthen your marriage. This does not mean that you need to spend $300 on dinner and a babysitter twice a month if it is not in your budget. (It certainly is not in mine.) All of this makes sense when you consider that our lives are entirely stewardship. All that we have is God’s, and we are merely caretakers of His goodness. Johnston had several tips for implementing this stewardship and detachment mentality to our lives and budgets. Catholics get a bad tithing rap sometimes. It is urged that Catholics give a portion of their income to the Church and charities. This is a suggestion that fits in perfectly with a stewardship mentality. It is important that we do this this first on our budgeting, not at the end. Our first priority needs to be the care of Christ’s Church and his poor here on earth, even before our own needs. Pray about budgeting. All the time. This suggestion really helped me. When I feel myself wanting to stray from my budget, urge myself to pray about it. Do I need to spend $20 on lunch for the kids because I am running late and cannot get it together to pack one? Nope. Get out the sandwiches. Does the home decor purchase I am contemplating really help accent my home and therefore help my hospitality? Or is it just a throw pillow? Are those eyeshadow palettes all really the same? Sometimes, yeah. This is not to say you need to talk yourself out of buying everything, certainly not. 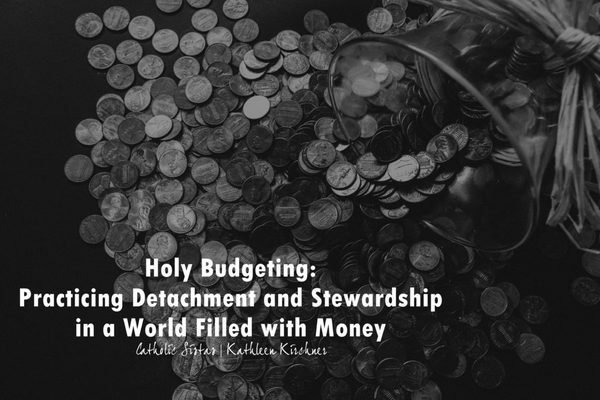 But stepping back and praying about your budget, your purchases, and how you and your spouse view them can foster a detachment from things and a stewardship mentality. Acknowledge that you will not be perfect. Budgets are goals, and our entire faith life should be striving towards greater holiness. We are never done, we are never perfect. We can always do better, appreciate more, and give more. The important part is to not be discouraged when we fail, but to pray and try again. Understand that your detachment and frugality will not look like your neighbor’s. A homeschooling family with eight children and medical bills whose sole breadwinner is either starting a new position or in a lower economic bracket will obviously not have the same budget as a newly married couple with two established incomes. Both families can be faithful stewards of their goods, however. But they must understand that their realities will look completely different. Spending money is not evil. Having nice things is not evil. Ignoring the poor, the Church, and elevating mere things to a level that they are not accorded is evil. We are all given different gifts, but we are ultimately all stewards of the King.